The recent floods and cyclone in Queensland have caused havoc at many locations in the state. Following these disasters, there has been a rush of community goodwill to those affected, and stories of people donating money, clothing, goods and labour are legion. This is not a new phenomenon. Perhaps families are more insular these days - many of us don't know our neighbours and are therefore surprised when they provide assistance out of the goodness of their hearts. In the aftermath of WWI, from which many Australian servicemen did not return and many more returned with terrible injuries and poor health, there was a similar outpouring of grief and then philanthropy for survivors and sufferers. One way this was manifested was in the construction of Anzac cottages, built in many states - often with donated land and materials as well as volunteer labour. 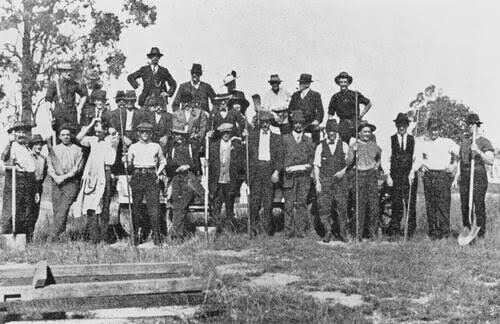 The first ones seem to have been built in Western Australia, but about fifty were built in Queensland (forty of those in Brisbane), many of them constructed with funds from the state lottery, the Golden Casket. 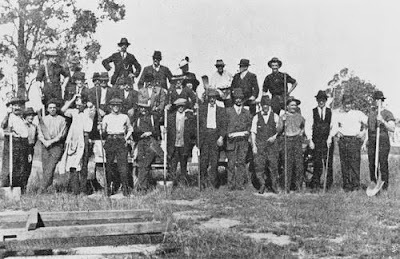 The following photograph at the State Library is recorded as being a group of volunteer workers on the job of building one of these houses. 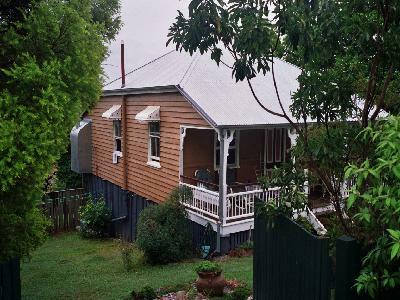 The first Anzac cottage was built at Wynnum, and was opened in August 1917 by the governor. Parliamentarian Harry Coyne initiated the concept of funding the houses from the Golden Casket, and Casket draws number three, four and five were earmarked for this purpose. All sold out quickly, and the draws were held at the Stadium, the forerunner of Festival Hall. One of these cottages has been heritage listed. It is known as Strathearn and is situated in the Brisbane suburb of Alderley. Here are a couple of pictures of it. English born John Thomas Warner was 42 when he enrolled at Enoggera, although he gave his age as 38 years old. Private Warner was buried in a shell explosion at Ypres in 1917. Rescued the following day he was sent home. He died during March 1920 and was buried in a war grave in Toowong. Thank you for this post. It is an issue that should be aired more often. After the 1914-8 war ended, there clearly was an outpouring of grief for the squillions of dead, survivors and sufferers. I cannot imagine the pain of parents, wives, children and friends at the loss of life and limb. But to get men to volunteer for war in 1914 and 1915, the government had promised to look after the wives and children while the men were away. They may have even promised to look after widows and orphans permanently, but that is less clear. Not charity of course; more as a national expression of eternal thanks. The 50 houses that were built in Queensland look (from the photos) to be excellent. But how many families lost their sole breadwinner in Queensland? I am anti-war in any case, and bitterly anti-conscription, but the least they could have done was look after ALL the impoverished war-families at a government level. Thanks Hels. I agree with your comments. I think our armed forces have a poor record when it comes to support of the sick and injured, and of their families.